mp3Tag Pro includes a built-in audio player module, which is used by default. The built-in player supports most formats (MP3, FLAC, APE, etc. ), but there is a small group of unsupported formats (like M4a). You can rename such files and edit their tags, but the built-in player will refuse to play them. If you work with such formats frequently and need the playback feature, you can simply switch to an external software player. The "Play files with" area contains 4 options. The first two refer to Winamp, a very popular audio player. Winamp 2.x or 5.x. If you have Winamp and don't know what its version is, just use this option. Winamp 3.x. This was a major release, the code of Winamp 2.x was rewritten, and many potentially interesting features were added. Later these features were incorporated into Winamp 5. Default program. It's your player that starts when you double-click the corresponding audio file in Windows Explorer. Different file types (MP3, MP4, etc.) can be associated with different players. mp3Tag Pro will start the corresponding player, as specified by the file's association. 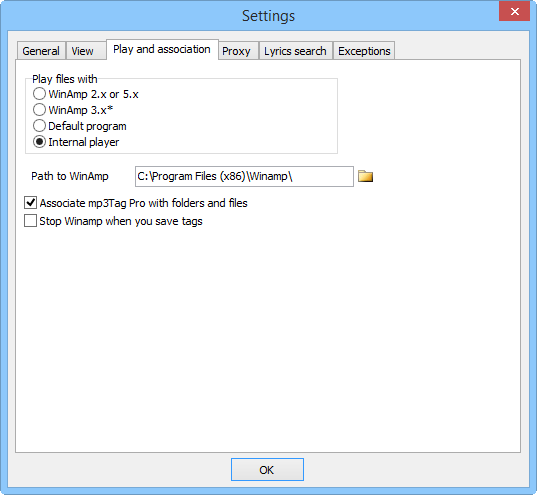 mp3Tag Pro detects the correct path to Winamp automatically. However, in some cases (if you did not install Winamp), you may need to specify the path manually. 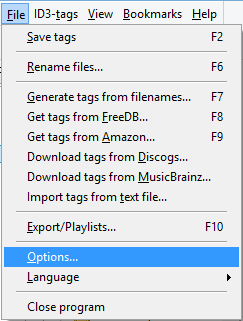 Use the folder icon next to the "Path to Winamp" field to select the correct folder. Associate mp3Tag Pro with folders and files. This adds entries into the right-click menu of Windows Explorer. This option may have no effect on some editions of Windows. Stop Winamp when you save tags. This allows updating tags properly. When some program (like Winamp) uses a file, the file is locked, and another program (like mp3Tag Pro) is unable to change it. This option sends a command to stop playback, which releases the file and allows saving changes. If it's the built-in player or Winamp, you can also pause and stop playback. With the "Default program" option, these buttons will not work. You will need to switch to your player's window and use its controls instead.